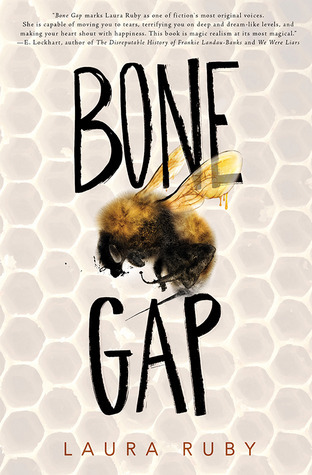 Bone Gap is modern fairy tale and magical realism at its finest. The book inspects the difference between the faces the world sees VS the people we are. The book also confronts how society views women: it’s uncomfortable, at times it makes my skin crawl, but it’s 100% necessary. READ THIS BOOK. I am going to write part this review in a slightly different style than usual, inspired by the strange writing prompts that Petey and Finn trades throughout the book. I hope I do the book justice! But if this part is too odd for you, feel free to skip down to the main review below! Describe BONE GAP using only adverbs. Loftily. Delicately. Mysteriously. Stealthily. Touchingly. Subtly. Violently. Bravely. Remarkably. Hopefully. Compose a haiku in honour of BONE GAP. I. Separate 1 girl from 2 boys. Make sure no one quite knows how. III. Take another girl, queen of bees: ensure she has more sting than honey: combine her with 1 boy. IV. Marinate the remaining boy in 1 teaspon of anger, 1 teaspoon of guilt, and a heap of insecurity. V. Mix in a magical steed, a beast, a dash of casual cruelty, a twist on reality. VI. Avoid contaminating the mixture with love polygons and conventional plots. VII. Serve with a fresh dose of perspective, accompanied by beautiful words. The People of Bone Gap. No One Is Fine. Just Like The Rest Of Us. Lost The Lamb. The Nightmare Slaughter. Get Real. Run. Jump. Showdown. The girl they loved most – and knew least of all – was gone. When the beautiful Roza goes missing, the previously sleepy town of Bone Gap is lights up with speculations and half-hearted gossip. Only Finn witnessed her kidnapping, though he is at a loss in describing her captors. The town scrutinises him, the boy who was always dismissed as spacey, and questions his involvement. His brother, Sean, in love with Roza but too cowardly to go after her, having been abandoned once too many times. The narration mainly follows Finn and Roza in alternate chapter. We see Finn as he’s navigating life after the kidnap, trying to piece the mystery together despite the mistrust from the people of Bone Gap. I love the uncertainty that shadows not only the mystery, but also the puzzle that is Finn. While we see things from his perspective, some things do not fit together quite right – though to tell you more would be a terrible spoiler. The reveal is wonderful and completely unexpected, a delightful mixture of both fantasy and real scientific facts. Although Finn’s chapters were a joy, I love Roza’s chapters even more. She is trapped by a madman who’s so terrible, he resembles the monsters of old fairy tales and myths. Why? Because she is beautiful. Her chapter narrates her life, a series of mishaps and gross violations perpetrated by men who views her as an object to be possessed. Nonetheless, she never loses her determination or her fire. I love Roza’s intense sense of self-identity, despite the labels people have tried putting on her. I also adored that she never lost her capacity for love or trust, regardless of the hardship and uncomfortable situations she’s had to face. She is a damsel who is capable of saving herself, and would totally bake you a batch of cookies after all of her heroics (if she decides you’re worthy). In short: Roza is freaking awesome! As much as the people of Bone Gap forgot her name, they wouldn’t stop reminding her of her face. On the other side of the coin, we have Petey, an equally fascinating and complex female protagonist. Petey has been told by girls to wear more make up, she’s been told by boys to wear a paper bag, she’s told by her mother that she will eventually find love – despite her appearance. She’s viewed by Bone Gap as a girl so desperate for love, she would throw herself at any guy thrown her way. When Finn approaches her and they start an all consuming, passionate, relationship – the commentary from other people are too much to bear: How could a beautiful boy be with an ugly girl? I love seeing Petey’s strength, but also her insecurities. My heart ached for her, but through it all – she remained a regal queen bee in every sense. I loved the lyrical prose and the fairy tale like quality of the writing. However, what I loved most of all is the questions that Bone Gap poses. The ones about our identity VS the way people perceive us. Of the role of women in society, and the beautiful characters who defy the patriarchy. We are not the sum of our appearances, of what total strangers – or even loved ones- have to say about us. I think everyone will get something different out of Bone Gap, depending on their views on these questions. In any case, if the review has not made it abundantly clear, I recommend this book to EVERYONE. Young, old, male, female, sighted, blind, whatever. Go read it, you can thank me later! Ahhh thank you so much! I was worried the first half of the post would be too weird for people XD But I thought I’d post it anyway cos hey, it’s my blog 😉 Thanks so much for sharing the AWESOME poem haha. I’ve been eyeing this book for a while now, so now I’ll definitely pick it up! I’m really into feminism books at the moment, so hopefully this won’t disappoint! I hope you enjoy it 😀 There is definitely a strong element of examining how the world views women! I am so glad you liked the bit at the start! WOW THIS SOUNDS AMAZING! I love magical realism and the whole premise of the story sounds really interesting! The lyrical prose that you mentioned makes me think of The Strange and Beautiful Sorrows of Ava Lavender, which I LOVED. I’m so keen to pick up Bone Gap! Petey and Finn’s relationship also sounds like it’s going to capture my heart (and hopefully not break it). If you like magical realism you NEED this in your life 😀 And omg I have heard so many beautiful things about Ava Lavender. It sounds 100% like my kind of book so I’ll need to read it. There’s much of Finn and Petey to love in Bone Gap! OMG THESE ARE SUCH COOL WAYS TO REVIEW. Beautifulllll ❤ And it sounds kind of like Paper Towns in how it's about mis-imagining people. Basically, I'm in love and I haven't even read it. Also, I concur with Cait. Your graphics are the most gorgeous things in the world. Teach me your waaaaays. EEEP THANK YOU I am glad you think so :D! You must try reading this book, guaranteed awesome! I am from Australia, insects and bugs are my friends. Love this review! This sounds so intriguing, I want to read it! You should definitely give it a go, I hope you’ll like it! This review… WAS FLIPPING FANTASTIC! I adored that first part of your review. I didn’t find it to be strange at all, I was so captivated by it! AHHH YOU ARE SO LOVELY JOSIE ❤ I hope you'll love this book as much as I did! If you like magical realism, you should eat this up with a spoon. I hope you’ll end up liking it, Raven! I think any book that could inspire such a wonderfully creative review has to be worth reading. This sounds so great. Feminism and fairytales. I can’t imagine a better combination! Incredible review! I’ve had this one on my TBR pile for some time now – I adore magical realism, so I’m definitely bumping it up the queue. I’m particularly interested in the way the book deals with misogyny, especially women who defy the patriarchy, as you phrased it. Ah if you love magical realism this one will be up your alley – it has more magic than usual for the genre! It definitely does look at how society view women in a very challenging way. Definitely one of the most creative reviews I’ve ever read! You definitely sold me, as soon as I have enough money I plan to purchase The Bone Gap. EEEP I am so glad to hear that Ana ❤ I hope you'll enjoy the book! AENTEE STOP REMINDING ME OF ALL THE BOOKS I STILL HAVE TO READ ON MY TBR! But seriously most of the books you’ve read are on my TBR. Great minds think alike? Awesome review btw! I love the formatting especially the short story part and it makes me want to read the book even more! The only reason I’d skipped out on Bone Gap was because of the cover. Bees honestly scare the heck out of me. Just get the book and tear off the dustjacket haha. The book is BEAUTIFUL, ROZA IS THE GREATEST. I hope you’ll conquer your fears of bees and check it out! I love the creativity of the review Aentee! You did a good job. I can’t for the life of me come up with poems of any kind. It’s so hard but you made it look so easy. Sounds like an interesting book to read. Will add it to my never ending TBR! Ok, this review is the best! 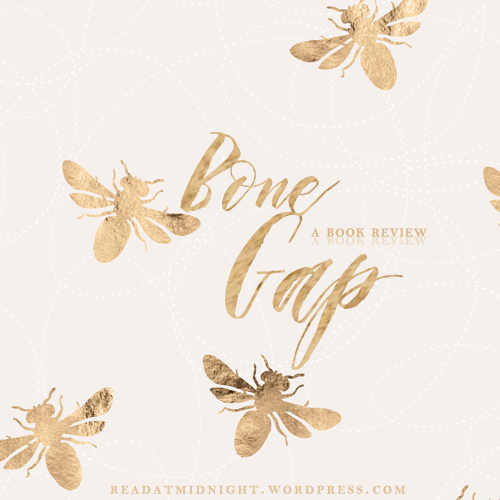 I will now be adding Bone Gap to my TBR. It sounds so dumb to say, but there really is something *magical* about magical realism. Lots of great writers in that sub-genre, too! And clearly Laura Ruby is one of them, if the excerpt about how being beautiful isn’t her identity is any indication. Absolutely gorgeous! This is SUCH a great review! I loved your experimentation, it’s so innovative. Interesting. For some reason, I thought this book was about bees. Now that I think about it, I think I’m getting it mixed up with another book. I wouldn’t have guessed this was what the book was like from just the cover. It sounds like they used some symbolism from the book for it though, so that’s pretty cool. Great review and it does look like you had a lot of fun writing it!